Matt Cooper has been a safety supervisor with Standard General in Calgary for the past five years. Prior to that he worked in commercial construction and as a utility locator. He is also an active member with the Alberta Common Ground Alliance Best Practices and Education & Promotions Committees. It’s this unique background that makes him particularly well versed in the safety aspects of trench and excavation work. Alberta Toolbox spoke to him about how to make sure everyone stays safe when working in trenches. ALBERTA TOOLBOX: Why is trench safety so important? MATT COOPER: Trench safety is very important due to the high potential of severity if a cave-in or sloughing of a trench occurs. The chance of rescuing a worker in a trench is very slim. If an incident does occur and a worker is buried, there’s a very high likelihood that they’re going to have a severe injury, if not a fatality. 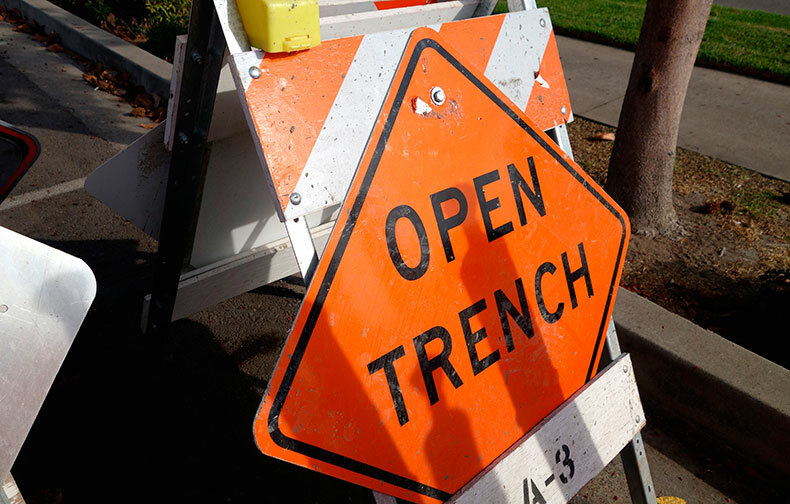 TB: Is it common for dangers to be overlooked or minimized when it comes to trench safety? MC: Complacency can be an issue for any task or any industry. As employers, we have to remain diligent at all times in educating our workers and immediately stepping in and intervening if we see any shortcuts being taken. I don’t personally believe it’s common in the excavating industry for people to take shortcuts due to the potential severity of the task that we’re doing. I think for the most part our industry is very well trained and very well educated. TB: What are some of the hazards that workers should be looking out for when they’re doing trench work? MC: Cave-ins are a common hazard as well as suspended loads, dust exposure and existing utilities. Also, a trench is a restricted space, and it could turn into a confined space. A hazardous atmosphere could be introduced due to work that’s going on above. You could have fumes coming down causing oxygen deficiency. You could be digging and find contaminated soil that might give off gases. There are many, many hazards involved. TB: What needs to be done in order to prevent incidents from occurring? MC: Plan ahead and know as much as you can about what is in the ground below you. Make sure you get your utility locates and do a thorough hazard assessment. You can reference the Alberta Common Ground Alliance damage prevention process document, which can be found on their website (www.albertacga.ca). It’s full of fantastic information for trenching and obtaining utility locates. Also, the Alberta Occupational Health and Safety Code Part 32 has outlines for trenches that include guidelines for different excavation depths and when protective structures need to be in place. TB: What about soil stability? Is that an important consideration? MC: Definitely. In Alberta, there are many different types of soil composition and, generally, you don’t know what you’re dealing with until you start digging. Groundwater is another important consideration because it can undermine your excavation walls, so you need to put a pump in place to make sure water is not building up at the bottom. You have to consider what’s going on around the trench, too. It could be next to a live roadway or there could be train tracks in the area that cause vibrations that loosen the soil. If the conditions change, you have to stop, reassess the situation and do your hazard assessment again. TB: What are the roles of employees and foremen in this process? MC: Employees as always in Alberta have the responsibility to refuse unsafe work. If they don’t feel an excavation is safe, under no circumstances are they to enter it. Foremen and supervisors are responsible for the safe operation of their crew, so they have to do everything they can to make sure that the excavation is safe before they allow anybody to enter it. Any concerns they’re having, they have to take to their immediate supervisor and make sure all the hazards are dealt with and controls in place before anybody enters. TB: Is there ever such a thing as a safe trench? MC: Any trench can be made safe to an acceptable level with proper planning and thorough hazard assessment. There are always risks involved in almost any task that we do. It’s a matter of minimizing those risks to an acceptable level through the hazard mitigation process. TB: Anything you’d like to add? MC: It’s becoming common industry practice in Alberta for clients, developers and excavating companies to have in place a ground disturbance permit of some sort, which is basically a checklist to make sure that everything is in place and the crew is ready to go. It’s a separate document specifically dealing with the excavation, so it’s a good resource to make sure that the crews have addressed everything they need to when it comes to starting and planning excavations. It is a tool to assist in identifying all hazards, ensuring corrective measures are in place, and aid supervisors/employers in ensuring their due diligence in providing a safe workplace.